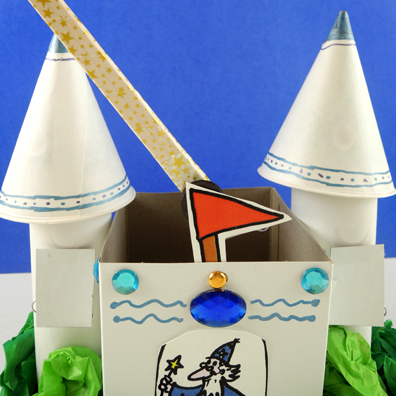 Use your magic wand to reveal the secrets of this enchanted castle – raise the drawbridge, hoist the flag, open windows, discover buried treasure, and more! 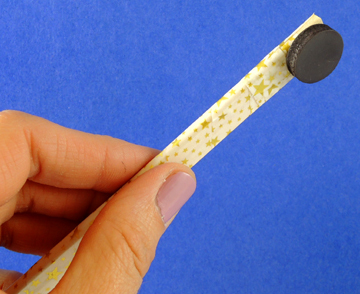 All it takes is a magnet and a few well-placed paper clips! We read I Wished for a Unicorn, written by Robert Heidbreder, and illustrated by Kady MacDonald Denton (Kids Can Press, 2000). A little girl wishes for a unicorn, and wow… one appears! Granted, it looks and acts suspiciously like her pet dog, but that doesn’t stop the two from having amazing adventures in a magic woods and enchanted castle. As far as construction, this castle is very basic. 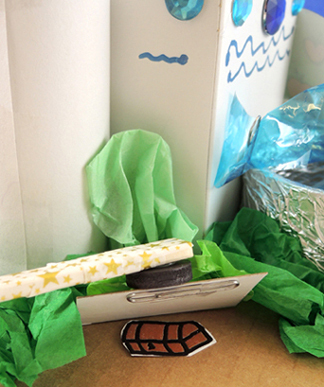 We used a 4″ x 4″ x 4″ craft box with the lid cut off, and hot glued it to a corrugated cardboard base. 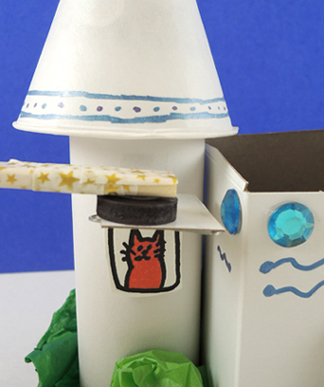 Add 2 shortened paper towel tube towers, 2 cone drinking cup roofs, and some (optional) green tissue paper shrubs . 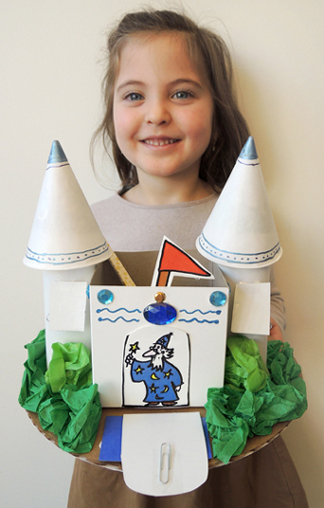 The drawbridge is a hinged piece of cardboard (we used the scrap from our box lid). 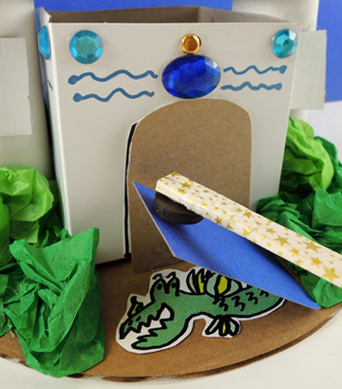 The moat is construction paper. 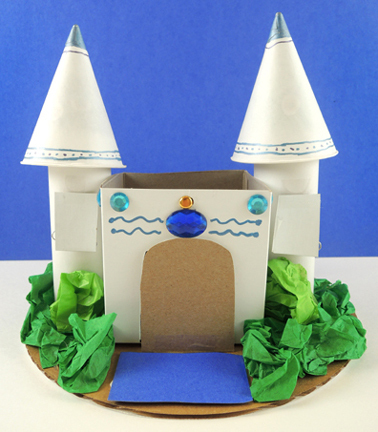 Wrap the castle with construction paper if you like, then decorate with metallic markers and perhaps a jewel or two. You’re done! Above the drawbridge, you can also raise a flag! 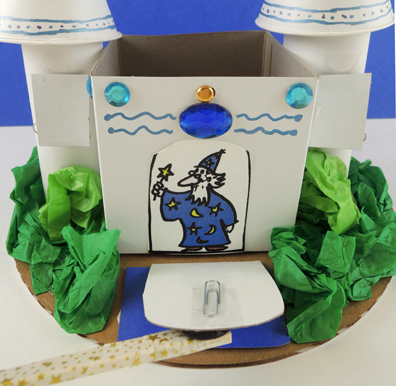 Use a hole punch to create a hole in the pole of the template flag, and in the wall of the castle. Thread a brass tack through the holes, tape a paperclip to the back of the flag, and fly it high! Around the back of the castle is an (optional) fountain. We wrapped a packing tape core with tin foil, then taped a 3″ x 6.5″ rectangle of blue cellophane inside. 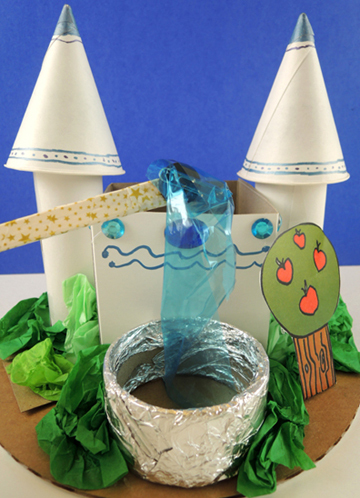 Use a paper clip and the wand to make the fountain water rise! When kids were finished with their castles, DR. 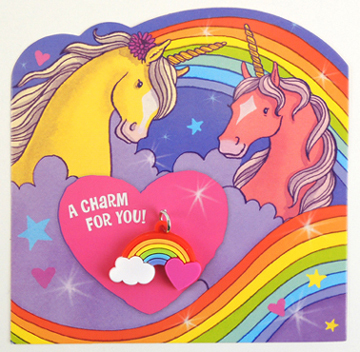 MAGICAL PURPLE UNICORN bestowed cards and rainbow charms! 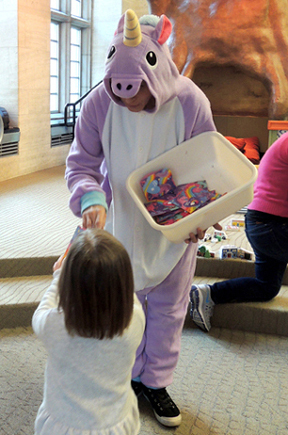 And yes, that unicorn onesie does feel just as comfortable as it looks. It started with an excited text from Katie: “Check out this LEGO set!” The accompanying image made my heart go pitter pat. 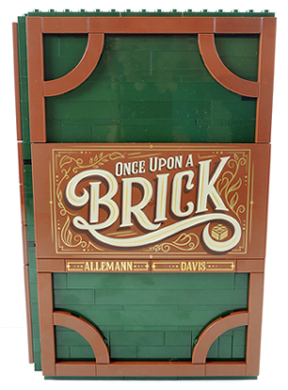 LEGO has created a fairy tale pop-up book. I think it took oh…maybe 15 seconds for me to order one for blog testing? The set was Katie’s discovery, so she gets to do the honors. Take it away, Katie! The brilliant folks at LEGO have done it again. 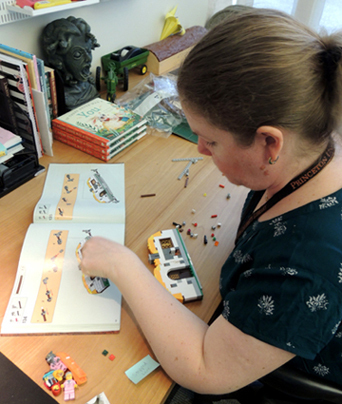 They created an honest-to-goodness pop-up book out of LEGO bricks! 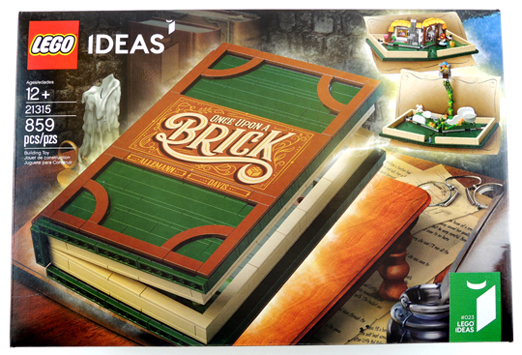 Before I go any further, I will fully admit that I was quite skeptical when I saw the “Once Upon a Brick” Pop-Up Book from LEGO’s Ideas line set in my son’s new 2019 LEGO catalogue. 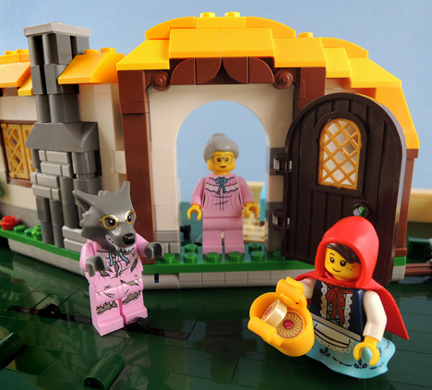 It claimed it was the “First pop-up book in LEGO history” and features two fairy tale stories: Little Red Riding Hood and Jack and the Beanstalk. Awesome, but would it work? The set retails between $50-$70. There are 859 pieces in the box and the suggested age range is 12+. The instruction manual is a novel in its own right, weighing in at a hefty 162 pages. 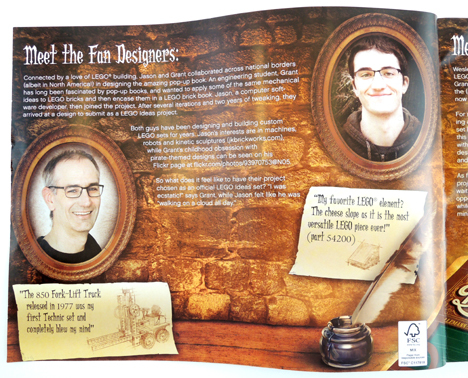 I loved that at the start of the instruction manual, LEGO introduced the fan designers who came up with the original idea for the pop-up book, as well as the LEGO designers who helped bring the book to LEGO life. 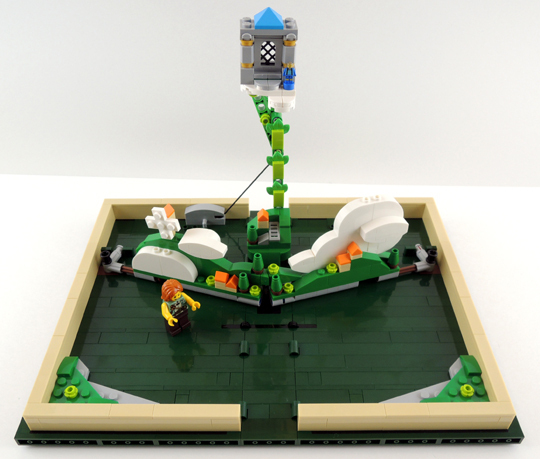 LEGO also provided the history of pop-up books, which date back to the 13th century, and briefly discussed the two fairy tales that are a part of the set. 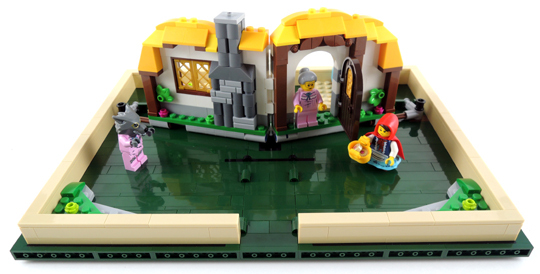 Along with words of encouragement to “Create your own fairy tale!” and “Build your own story…,” the instructions to build your LEGO set starts. There are six bags of LEGOs to build the pop-up book. I found the instruction manual was straight-forward and easy to follow. There were only a few times when the instruction images were a bit tricky and forced me to slow down to pay close attention to the details. There are also lots of little pieces, especially when building Jack and the Beanstalk, so have your nimble fingers ready to attach small LEGOs to each other. The instructions have you build the Little Red Riding Hood cottage first. As I attached the pieces inside the book covers, I wasn’t sure the cottage would properly fold down and create the pop-up book illusion. But it really works! After carefully removing the cottage from the book, I built the Jack and the Beanstalk tiny town and the beanstalk itself (complete with the giant’s castle at the top!). The town is adorable, surrounded by puffy white clouds, and the beanstalk grows when you open up the book. 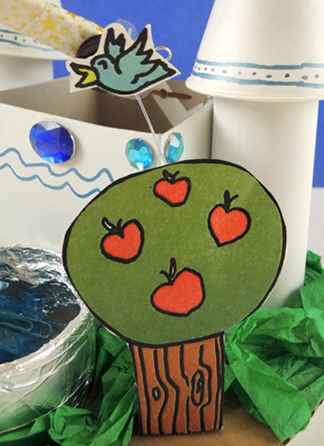 You read that right: the beanstalk grows as you open up the book. 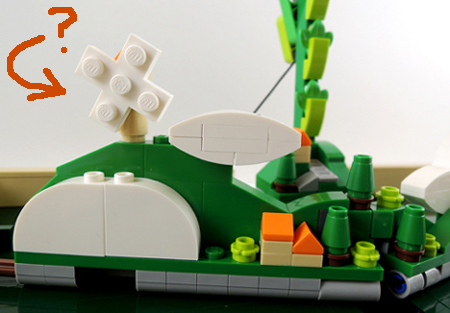 The attention to detail with this LEGO set is remarkable. You get the feeling that you are handling a real book when you have it in your hands, and the ease of how the pieces pop-up when you open the covers is stunning. My *only* complaint – and perhaps it is merely a humble suggestion – is that the little windmill blades in the Jack and the Beanstalk tiny town should have been a different color. They sort of blend into the white clouds surrounding them. It took me about three hours to put the LEGO set together. I do agree with the suggested age range of 12+. The complexity of the set would be tough for younger kids to complete on their own, but they could probably build it with assistance from an adult. My rating for the newest book in the Cotsen Children’s Library special collection: 5 out of 5 stars! Hungry? 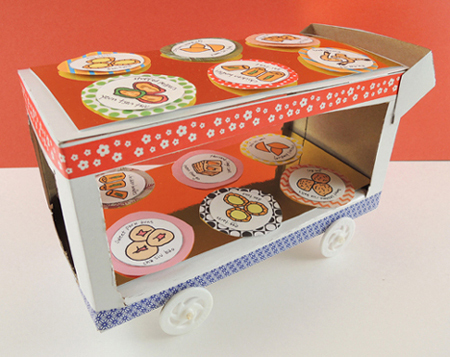 We invite you to peruse the contents of this adorable dim sum cart. 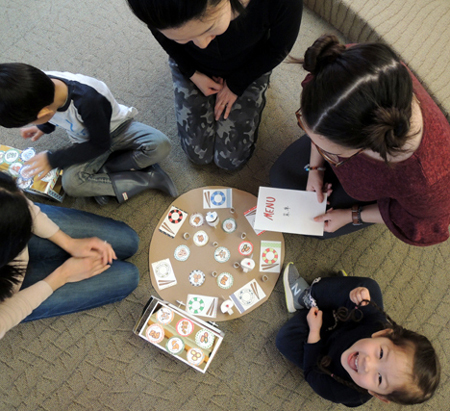 In addition to being stocked with deliciously delectable dishes, the cart is a bilingual matching game with an additional story time social twist! We read Dim Sum for Everyone! by Grace Lin (Alfred A. Knopf, 2001). Follow a family as they sample the many little dishes served at a dim sum restaurant. Pork buns, fried shrimp, egg tarts…the carts have something for everyone! The book concludes with an excellent essay about dim sum – it’s history, traditions, and social aspects. Fantastic book! First, the cart! Use a box cutter to create a square in one of the short sides of a box (leave the other short side intact). Next, cut hinged rectangular flaps in the long sides of the box. 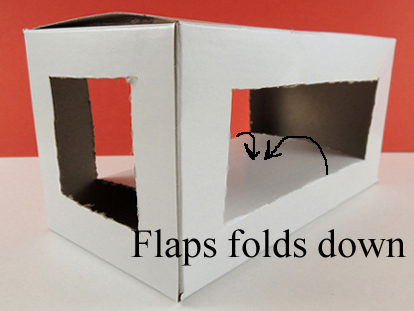 Fold the flaps down to create the lower “shelf” of the cart. Secure the flaps in place with tape or hot glue. Add a wheel assembly to the bottom of the box (you’ll find instructions and alternative wheel suggestions here). Use leftover box cardboard to make a cart handle. We also added gold mirror board and patterned tape to make the cart extra fancy. Time for the food! 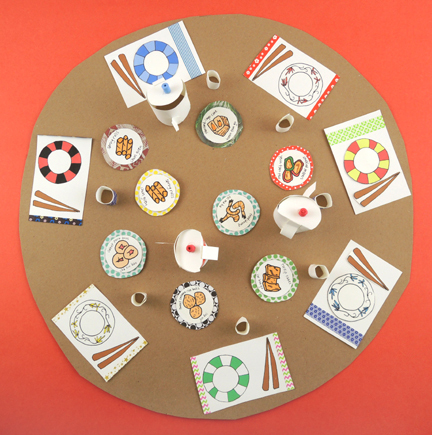 Color and cut the dim sum dishes from the template, then glue them on top of construction paper (or patterned paper) circles. 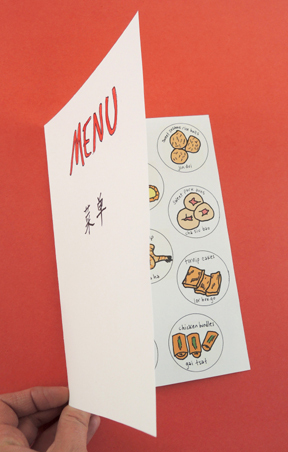 Thanks to Lin’s awesome illustrations on the front and end papers of the book, the dishes are labeled with their English and Chinese names. To play the game, kids rolled the carts up to their customers. The customers would point to a menu item, and the kids had to locate it on their carts! 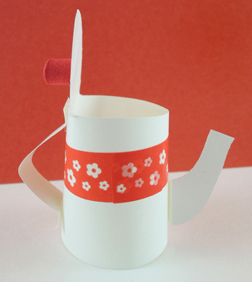 Oh, and we also included a cute place setting for your customers (template here). The book mentions how social dim sum dining is, so we made a couple tables (i.e. 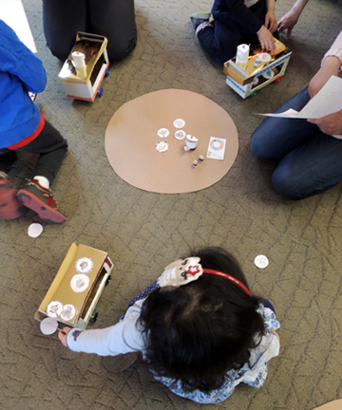 brown poster board circles) and asked the story time grown ups to sit around them. Kids traveled to ALL the tables, playing the matching game with everyone’s grown up! 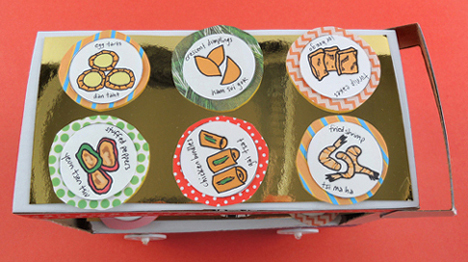 If you decided to add this social aspect to your story time, just make sure the kids write their names on the backs of each of their dishes so they can be returned to the proper cart. The final touch on this awesome project? 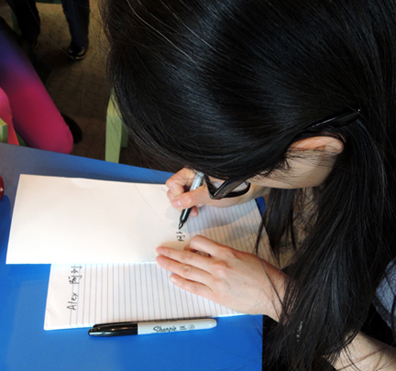 Our colleague, Dr. Minjie Chen, stopped by to write the kids’ names on their menus in Chinese characters. The absolutely loved it. Thanks Minjie!